Fewer than a third of the required number of Gypsy and traveller pitches in England have been built, with some funding going unspent. Local authorities have spent almost £35m creating 1,800 pitches since 2012, despite an agreed need for about 6,000. The Gypsy and Traveller Council said authorities are "not living up to legal or moral obligations". The Local Government Association described pitch provision as a "sensitive" issue for councils. It would not detail those sensitivities, but a spokesman said: "Local councils understand the different needs and aspirations of their communities best. "They should have the local tools and flexibilities to engage, assess and positively plan for meeting the current and future need of the Gypsy and traveller communities in a local area." The BBC sent a Freedom of Information (FOI) request to 325 councils regarding provision for traveller groups between 2012 and 2016, of which 306 responded. According to the FOI figures, councils calculate 5,492 pitches are needed but in some areas that is over the next 10 or more years. The Equalities and Human Rights Commission said there was an "immediate need" for about 6,000 pitches. Gypsy and Traveller Council chair Phien O'Reachtagian said: "Overall councils are absolutely not living up to the legal or the moral obligation and are perpetrating segregation - and then they complain when travellers pitch up [illegally] in towns. "It comes down to prejudice and lack of courage. 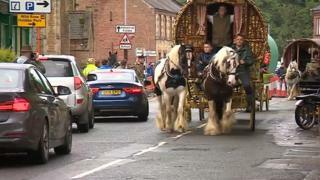 People living in areas where Gypsy and traveller sites are planned are reacting to having them in their area, rather than waiting to see if there are problems." However, some authorities have blamed a lack of suitable land. Tony Page, leader of Reading Borough Council, which is currently holding a public consultation over the proposed location of a transit site, said the town was "very tightly constrained". Of 80 sites initially considered he said only one had been identified as "potentially suitable". Half of England's councils have not created any pitches since 2012, and just under 50 have no pitches at all. Between March 2012 and December 2016, councils said they received £26,950,872 in Traveller Pitch Funding from the Homes and Communities Agency (HCA) and in total spent £34,645,397.50 delivering new pitches. Coventry City Council was successful in its bid for funding in 2013, with £1,072,793 agreed. However, it said due to "insufficient time to complete the works" the authority had to return the cash to the HCA. A council spokesman said at the time three traveller families were living on the site it hoped to expand. For health and safety reason's contractors could not work around them and "sites to which the families could move were explored but to no avail". Several councils refused to comment directly on the BBC findings, including Basildon Council, which evicted 80 families from their illegally-built homes at Europe's largest traveller site at Dale Farm in 2011. Basildon was among those councils that have not created any new pitches since 2012. In the 2011 Census for England and Wales, 58,000 people identified as Gypsy or Irish traveller, but the Gypsy and Traveller Council said the figure for England was more like 360,000. There are currently just over 13,000 authorised pitches in England, based on the FOI figures. According to the Department for Communities and Local Government's last published report in January, there are almost 3,000 Gypsy and traveller caravans on unauthorised encampments.